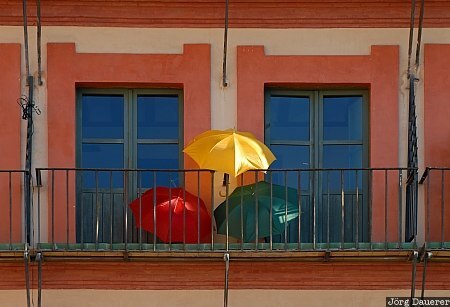 A yellow, a green and a red umbrella on a balcony at Plaza Corredera in Cordoba, Andalusia, Spain. This photo was taken in the morning of a sunny day in April of 2008. This photo is part of the exhibition The color Yellow (June 2013). This photo was the image of the month in June of 2009. This photo was taken with a digital camera.